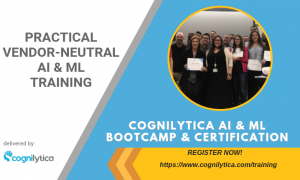 Cognilytica’s AI & ML Project Management Training & Certification Boot Camp is recognized around the world as one of the best AI & ML as related to Project Management training course available anywhere. The Boot Camp is an intensive, three day “fire hose” of information that prepares you to succeed with your AI & ML efforts, whether you’re just beginning them or are well down the road with implementation. Cognilytica’s training is the only public course that Cognilytica offers, reflecting the best thinking and research that Cognilytica produces. What makes the Cognilytica Training so special? Offered as both Open Enrollment at our Training Locations, or as private, on-site training for groups of 20 or more! Interested in on-site training? Contact us! 1-2 times a year ??? Cognilytica AI & ML Project Management Training & Certification is offered as public and private courses, as well as custom-designed courses for your specific and special needs! Interesting in enrolling? Contact us! Why is AI a “thing” now? Do We Even Need AI? What Did We Learn from Big Data? Do you even need Big Data for AI? How do we encode experience? What exactly is (in) a ML model? Where does the Model Go?